With a thousand shade of blue (but not only), it takes inspiration from the world of fairytales and evokes the colours of nature, from the blue of the ocean to the green of marine algae, passing through pale pink a pastel violet. "It's the latest colour-crazy trend using metallic and pastel shades. The inclination is to go towards ghost hair, meaning transparent and translucent colours. Bright and strong block colour is no longer in fashion.” Italian hairstylist and colour guru Daniele Caltagirone. 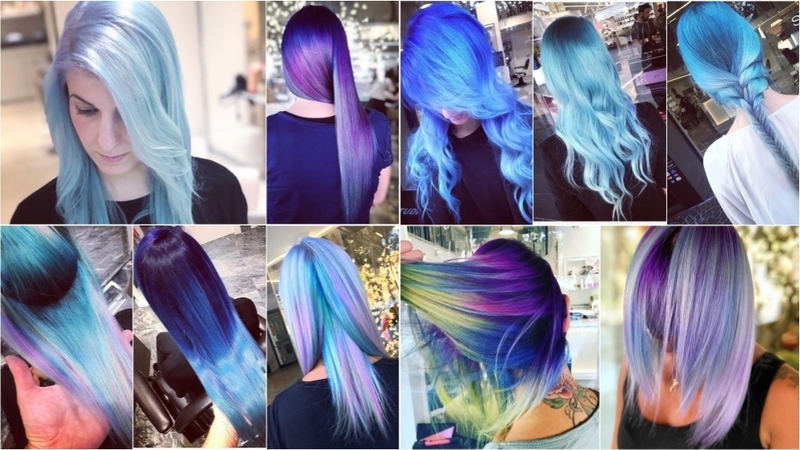 Mermaid hair is for those who want a burst of energy. These colours are ideal for people with blonde hair or a golden brown base. For those with black hair or chocolate, colour lifting is necessary. Do they work all types of skin tone? "I recommend Mermaid Hair to people who have a fair complexion. The shades of blue, lilac, pink and green are comfortable with white skin. To be avoided, the orange, the magenta and the red", Daniele explained to us. For those with an olive complexion or who lack the courage to colour all their hair, she suggests they pt for a contouring: nuances that enhance the colour of the skin close to the face and cooler tones away from the face. "In the salon I use Revolution Neon by Alfaparf Milano. These are fluorescent colours that glow in the dark, very trendy, which have an intense and lasting pigment. I then go to paste them with a Clear, giving them a mermaid or ghost effect. These are direct colours, without ammonia, which last up to 12 washes," says Daniele. To keep the hair healthy, it is possible to use keratin products and ultra-moisturising masks. To maintain the brilliance of mermaid hair, choose protective sprays that defend against sun, salt and UV rays. "In the salon we use products hat do not contain salts and sulfates, with very delicate surfactants and with an acidic pH. This allows you to keep the cuticle closed, ensuring that the colour lasts longer," adds Daniele.For home use, he recommends washing in tepid water and to using a sun protection spray. In the common mis-held belief that mermaid hair can only be extra long (have you ever seen a mermaid with short hair?). "Yes to full scissor cuts; no to feather cuts - because they can open up the cuticle of the hair. A must-have is sinuous waves, to be enhanced and defined with a wet effect gel cream. The finger waves typical of the 1920s are also very on-trend, as is a loose plait or braid, both of which enhance the contrasts in colour.